I'm working on something right now, and I had a need for a Domains At War unit of giant owls with riders. 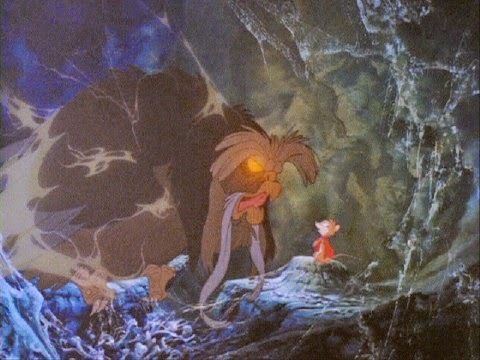 Pretend Mrs. Brisby is a halfling. Paging through ACKS, I see the giant roc is the first thing that matches (giant hawks can't take riders), and that's easy enough to reskin into an owl, honestly - owls are the night shift of the birds of prey. I got to thinking about the eyes of an owl that big, however, and to the right here is what immediately sprung to mind. It inhabits an enormous cave, full of giant spiders it occasionally snacks on during the day. Shaking off webs as dusk settles, it glides silently out to hunt. A small party of player characters are out on the road at night; they hear a slight swish, a scream; the flash of glowing golden orbs; exultant in the success of the hunt. The mage and his horse have been lifted into the moonless sky, out of sight and forever lost. That, I believe, is badass, and much scarier than a roc. You might see that roc coming. As the roc is to the sun, so the owlroc is to the moon; owlrocs are Chaotic to the roc's Lawful. If pressed, I'd say a vulture-roc would be the Neutral counterpart - all things equal in death, and such. Somebody's gotta eat those dragon and purple worm corpses. Yes, I am being really lazy and boring and copying the roc stats, but for the grouping name. They inherit the regular owl's chance for surprise. Owlrocs are powerful creatures living in high elevations and temperate environments. They look very much like huge, especially hoary great horned owls. Owlrocs frequently consume large mammals; horses, cattle, overweight mages. Owlrocs fly almost completely silently; creatures encountering an owlroc in flight suffer a -2 penalty to their surprise rolls. If an owlroc hits a creature smaller than itself with both talons, it will automatically grab the creature (no saving throw). If the creature is light enough to carry, it may be carried off. To escape the owlroc's grip, the creature must successfully save vs. Paralysis at -4. Owlrocs lair in shallow caves in the sides of cliffs, hills, or mountains, in the highest elevations they can find. Abandoned mountain keeps are a favorite roost. A rare variant of burrowing owlroc is known in equatorial climates. When an owlroc nest is encountered, there is a 50% probability that 1d3 eggs or 1d2 young are present. Owlrocs defend their young to the death. If eggs or young are captured, they can be trained as mounts by chaotic characters. If a lawful being encounters an owlroc, the owlroc will have a -2 penalty to reaction rolls, while a neutral being suffers a -1 penalty. Owlrocs are somewhat chaotic, and they prefer to deal with the same. Owlrocs may carry up to 15 stone (150 lb), and move at full movement; they may carry up to 30 stone (300 lb) at half movement. Large owlrocs can carry up to 60 stone (600 lb) at full or 120 stone (1,200 lb) at half. Giant owlrocs can carry 300 stone (3,000 lb) at full or 600 stone (6,000 lb) at half. So! Please consult Domains At War : Battles, pg 79 for the stats for a unit of Giant Owlrocs - the same as Giant Rocs. I'm going to give the Behemoth Cavalry rules from pg 86 a workout to see what happens if we slap a couple elvish bowmen on the back. We're putting bow-toting elves on the back (or whatever, elves are chaotic to me), and we're going to bard our owls (barred owls? get it? puntime funtime!). To keep max movement, we need to stay under 60 stone. Our two elvish bowmen riding will total 32 stone, leaving us 28 stone to work with. D@W:C pg 40 tells us gigantic scale barding weighs 24 stone - so let's go with that. So we can keep our movement of FLY 8/16/24. (2 * 9 (owlroc)) + (2 (elf rider)) / 3 = AC 6.667 ~= AC 7. The barding is worth it, we'd have been AC 5 without it. We're going to go forward assuming two elves riding - D@W tells us that will be equal to the sum of the roc and the two elves, which comes to 14+2. ( 14.5 HD * 5 ) / 15 = 4.833 HP, or, 5. If you haven't read how Domains At War works, you might be surprised by that HP total. Remember, there's 5 owlrocs and 10 elves in this unit - a unit of actual elves has 10 HP. It takes a lot less massed fire to take out 5 individual creatures than 120 in formation. Turns out your buddies keep catching arrows for you. Owlrocs have 3 attacks, 2 talons, 1 bite, 1d4+1/1d4+1/2d6. We can skip the calculation - Giant Rocs from D@W:B pg 79 tell us there's 3 attacks at a throw of 1+. The elves contribute their ranged attacks - since there's only 10 elves in a unit, that has to be recalculated at the new density. 10 * ( 1 + .5 ) * ( 3.5 ) / ( 20 * 4.5 ) = 52.5 / 90 = 0.5833 = 1. The elves on back launch a single missile attack at their throw of 9+. (2 * 1 ) + ( - 1) / 3 = .333, or, +0 morale. The elves' -1 morale negates the owlroc's morale - I know I'd break quickly flying around on a giant owl above a battlefield before the invention of parachutes. I'm relatively sure the BR is correct. Pretty pricey, all in all, to keep a flight of owlrocs in the air. They are, however, tough to hit, hit back hard, and are flying, so against the right sort of units they can certainly do good work.